Two apparitions of Mary are the inspiration for this original icon. Our Lady of the Snows and Our Lady of Guadalupe both involved natural events at miraculously unnatural times: Snow in August showed Roman Christians where to build St. Mary Major. Roses in December helped Juan Diego convince a skeptical bishop. 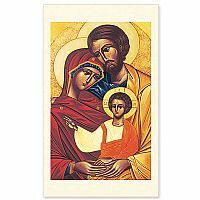 Icon holy cards are 3" x 5", a convenient size for use as gifts or bookmarks. The backs are blank except for a faint colophon at the bottom, leaving plenty of room for custom imprinting with your own message. 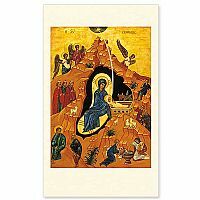 Brother Claude has created for us an original religious painting in iconographic style, but it is obviously not an icon in the Orthodox sense precisely because of its originality. The image serves the traditional purpose, however, by allowing us focus our attention when we pray and to gain new insight into the Word of God and the traditions of His Church. Apparitions of the Blessed Virgin Mary have been reported many times over the last several centuries. This icon juxtaposes and reminds us of two of the more famous of these events, one from the old world and one from the new. Both of the events included miraculous natural occurrences at unnatural times, snow in August and roses in December. In 3rd century Rome, snow fell in August to mark the location for the first church to be built in that city dedicated to Mary. To Mary�s many titles was added "Our Lady of Snows." The Basilica of St. Mary Major still stands as one of the great churches in Rome whose dedication is celebrated in the Catholic Church calendar on August 5. 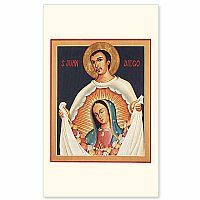 In December of 1531 in Mexico, Roses bloomed to help Juan Diego convince Bishop Zum�rraga that he had seen Our Lady of Guadalupe. This icon was created as a welcoming gift from Mount Angel Abbey to Archbishop Francis George when he became bishop of Portland, Oregon. (He left after serving just eleven months before moving to Chicago to succeed Cardinal Bernardin.) Archbishop George is a member of the Missionary Oblates of Mary Immaculate and a graduate of Our Lady of the Snows Seminary in Pass Christian, Mississippi. 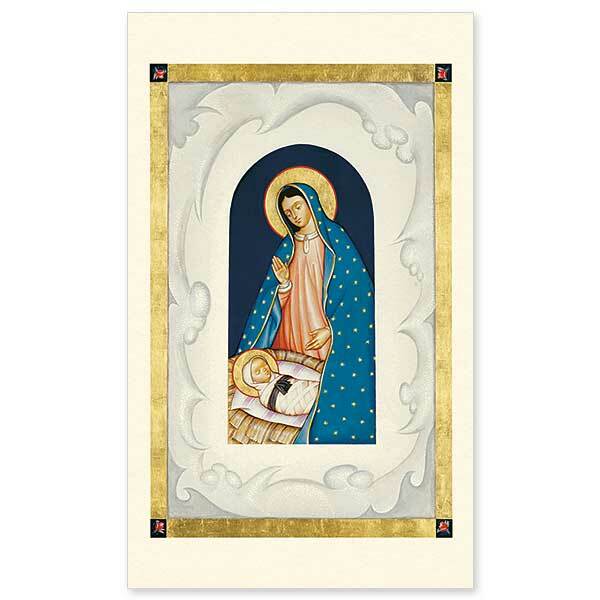 Mary has the features and dress of Our Lady of Guadalupe in this icon. She stands over the Creator of the Universe, manifested as a tiny, helpless infant. 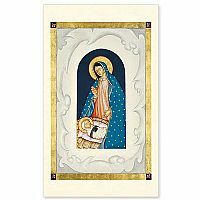 She is the agent of His Incarnation into the midst of His Creation, symbolized by her cloak covered with stars enveloping her and the manger of straw. The background of the center scene is a deep, featureless blue, symbolic of the pre-creation void. 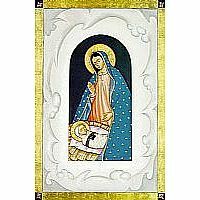 The black girdle which Mary had about her waist in the Guadalupe image has been transferred to the Babe as part of His swaddling clothes. It is a symbol of her pregnancy, and now she has given birth to Christ and He will give birth to His Church. 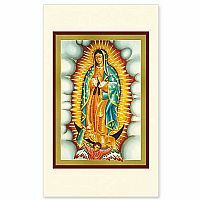 Mary�s right hand is in the same position of prayer as the Guadalupe image, but her left has dropped toward Jesus, directing her (and our) prayer to Him. The frame of snow and storm forms a sharp visual contrast with the peaceful Nativity scene. It recalls the cold of December, 1531 and the miraculous snowfall in the heat of a 3rd century Roman August. It also recalls the world of sin and struggle into which this helpless Child was born and which He came to save. The frame of snow is framed again by the gold of Divine Light and the miraculous roses of December.